You may visit the Great Wall of China year around. You will find fellow travelers there at any season, but when seeing the Wall in spots with higher elevations, consider that winters can be extremely severe. In spring or autumn, be sure to bring outer wraps, and in summer bring water to drink or be prepared to purchase something to drink from vendors. The very best two months to visit are May and October. Generally, the most popular sight destinations along the Great Wall are much less crowded on weekdays. The tourism services are there for you and can help you with tips on the best times to visit particular points of interest. Related article: best time to visit the great wall of china. Please be aware that in China water is not drinkable directly from the tap. It is best to buy bottled mineral water. Do not eat raw or partially cooked vegetables or salads that have not been washed in bottled mineral water or boiled water. Buying food in Asia is rather inexpensive. To be sure of the quality and safety of the food, it is best not to eat from street vendors. Purchase food from restaurants instead. Of course, the menus will all be in Chinese, but it is OK to look at other tables and point out foods you wish to choose. Also, remember that many restaurants will only have chopsticks for eating utensils. For a more familiar experience, try international restaurants, where menus are in English, but these will be more expensive. There are many different forms of transportation in China. During your travels in the country you may use several modes or even all of them. Usually fast and cheap, the price depends on the size and comfort of the taxi. Look to see that the meter is turned on at departure and look again at the destination to determine your fare. When taking a trip that engages the taxi for more than 23 hours and/or more than 15 kilometers and there will be an additional charge. Often, communication with the taxi driver may be a challenge. A real experience! Agree before departure on your destination and rate. Avoid being charged for the taxi service and the ride separately. Be sure the charge for the entire trip is covered and agreed upon before departing and be sure to tip the operator when the ride is complete. You will immediately see that bike riding is very popular. Renter beware that the deposit is often hefty and biking through the heavy traffic is not very safe. Definitely for the more aggressive traveler especially at peak hours. There are mini-busses available where you can usually find a seat, but these are usually more expensive. Long-distance busses are generally cheap. Expect lots of stops. Be sure to book in advance. Destinations will be where places to stay are inexpensive. In Beijing, Shanghai, and Hong Kong the metros are fast and cheap. The traveler must be aggressive and not mind jostling crowds. There is a flat rate for as long as you stay in the metro. Tickets are purchased at the ticket office. The hygiene aboard the train is not always optimal. It is best to remember to carry your own toilet paper. Most trains have boiled water for sale and the long-distance trains do provide a dining car. Trains should be booked in advance. Reservations for train transport can be made at the special offices for foreigners. With over 6,000 km of navigatable waterway, the beautiful Yangzte River is the longest in China. There is both transport of goods and persons available. Please be sure to contact your country's embassy or consulate and tell them about your trip. Check in at the embassy when you arrive in China. Find your country's embassy website for more information on phone numbers and locations of embassies. Your embassy will keep you up-to-date on important news about travelers in the country. There are always current travel information that is very essential to keep in mind. Also, you are expected to register with the police within 24 hours after your arrival in China. If you are staying at a hotel, the hotel will take care of this registration for you, but if you are staying with friends or in a more remote area, you should be sure to register with the local police. 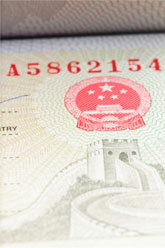 In order to enter and remain in China, you will need a visa and a passport with at least six months validity. Obtain the correct visa before your trip. It is difficult or impossible to change the visa in China. You are expected to comply with your visa specifications. You must carry your passport and visa with you at all times while you are abroad. If you lose your visa or passport there is a two-week process to obtain a new one. When leaving, you must get an exit visa. Have all your documentation with you when you apply for the exit visa. You will not be allowed to leave the country without one. Medical facilities are not the same in other countries as they are in yours. Larger cities may have more advanced hospitals and technology. Rural areas have less medical care facilities or perhaps none. Keep a first aid kit with you and if you need any presciptions or over-the-counter medications, please carry them with you when you enter China. Also, check with your medical insurance before travelling. Do not just assume that you will be covered by your medical insurance while you are abroad. There are always some travel restrictions with which to comply. Please check with your embassy to understand any restriction requirements. Almost everyone in China speaks Mandarin Chinese. However, there are many dialects. There is very little crime in China, but should you have something stolen from you, report the theft to the proper authorities and they will do everything possible to return your property. You may also contact your closest embassy. Have their phone number with you at all times for any emergency. There is an English newspaper, China Daily, released everyday except Sunday. Hope you have a wonderful adventure visiting the Great Wall of China! These many tips will help make your journey a pleasant one. The Wall from space ?